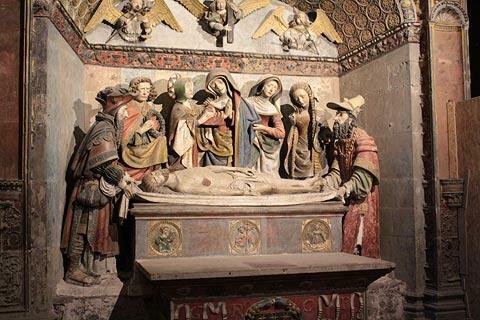 France This Way comment: while Rodez lacks the remarkable beauty of towns such as Albi, to the south of here, it has an important cathedral and several other interesting historic buildings in its medieval centre. 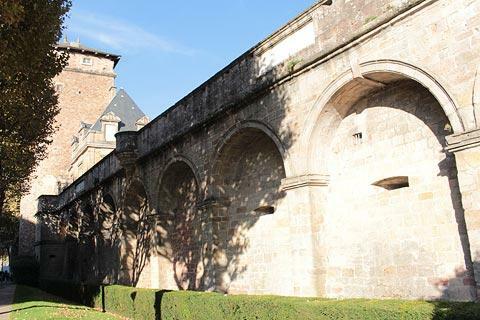 If you are arriving by car then I suggest you head towards the cathedral, turn right in front of the cathedral and park in the Foch underground car park. Parking charges are reasonable and the car park is well placed to explore the town centre. 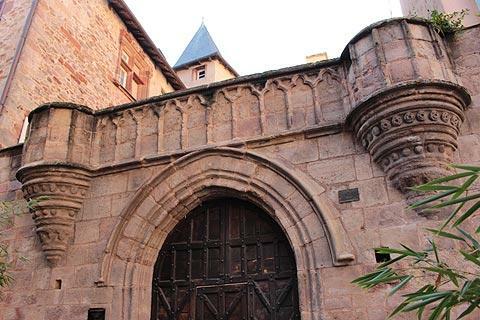 To appreciate the architecture in Rodez at its best you can’t go far wrong if you pick up a map from Rodez Tourist Office on Place de la Cité with a walking tour which will lead you around the historical centre where key places to see are conveniently marked with numbered plaques. 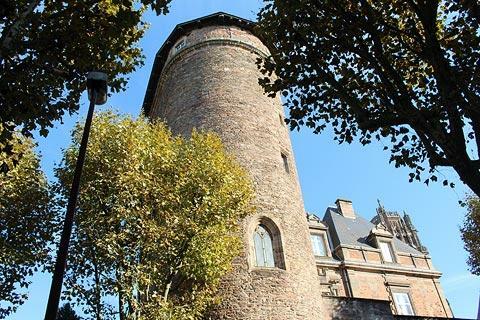 It is the historic centre round the cathedral that is of interest to visitors. 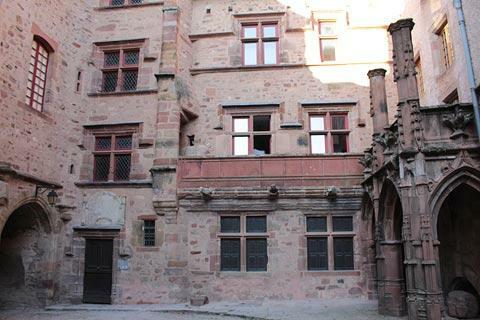 Many of the buildings of interest are impressive townhouses built between the 15th and 18th centuries: because of the wide time span they are in a variety of styles and sometimes incorporate interesting architectural features such as staircases, small towers and renaissance windows. 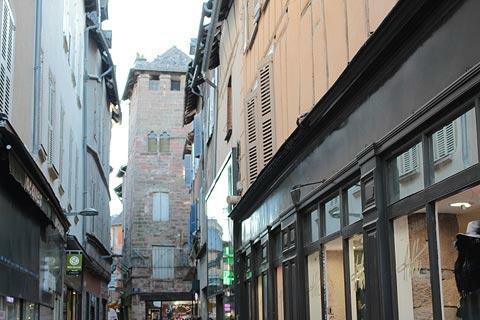 Many of these are in the old medieval streets, little alleyways and pedestrianized shopping lanes behind the Cathedral. 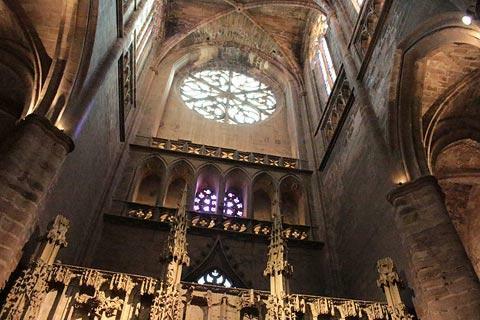 You will quickly reach the gothic style Cathedral of Notre Dame, built from the 13th to 16th century with interruptions for the Hundred Years War, an outbreak of the plague and local administrative problems. 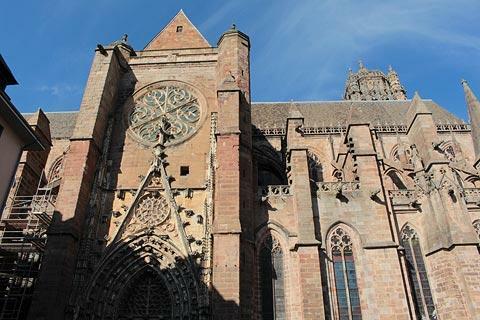 Built in red sandstone the cathedral is one of the largest in the south of France and towers over the surrounding city. 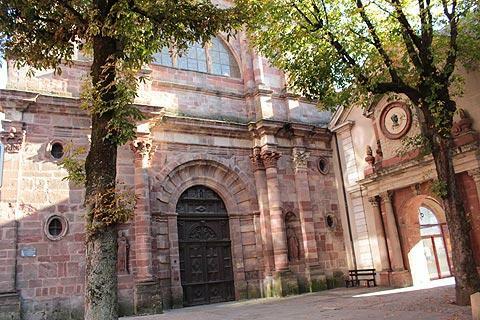 The cathedral also formed part of the fortifications for Rodez: this explains why the lower western parts are more like a fortress but the upper parts and the belltower are much more ornately decorated, and why the main facade does not have an entrance door: it was once a defensive wall for the town. 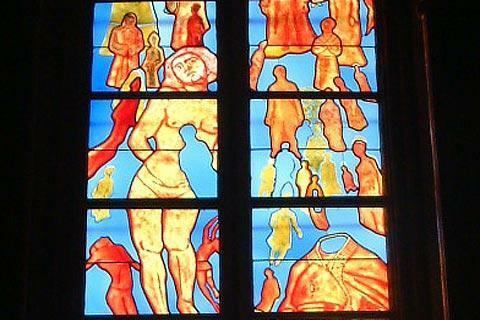 Inside the cathedral the points of interest include a series of contemporary stained glass windows, the rose window, the organ and several statues including a painted medieval 'mise au tombeau'. 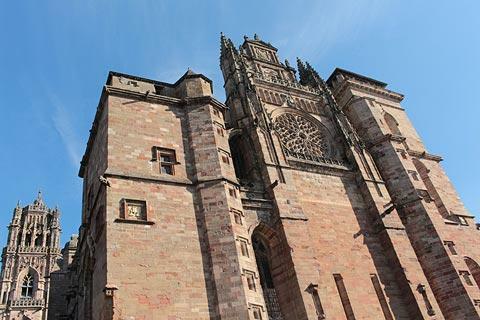 You will find an excellent range of boutiques and chain stores, and there are open air markets in Rodez three days a week throughout the year. 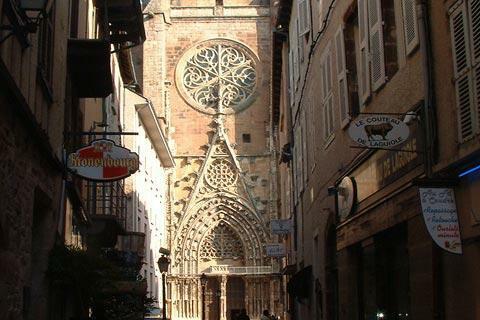 Rodez is also a great place to visit to eat out. There is a huge choice of restaurants, and generally the quality is good. 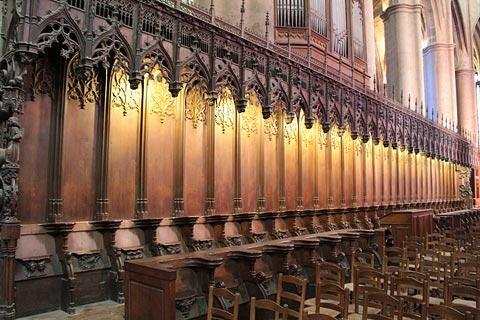 There are many cheap and cheerful ‘Menu du Jour’ restaurants around the Cathedral, but you can also find fine dining. 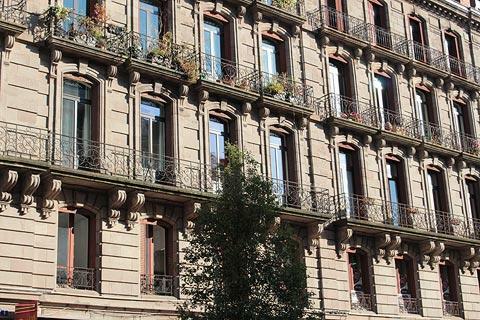 Two great cultural visits are on offer: the Beaux-Arts Museum which exhibits the works of local sculptor Denys Puech, and the Fenaille Museum of History and Archeology which houses amongst other artefacts, a unique collection of Menhir stone statues and has a Renaissance Mansion incorporated in its centre. 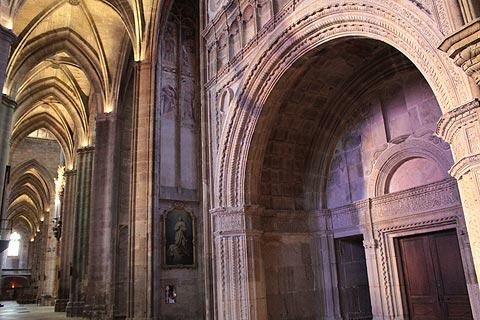 Because Rodez is a departmental capital it is possible to find events all year around with theatre and music concerts held on a regular basis. Annual events which are well worth attending if you visit at the right time are held in the public gardens below the cathedral, the most notable being the firework display for Bastille Day (July 14th), the Music Festival called ‘Estivada’ (mid July) and not to be missed, ‘the Pétagne championships' (held late July early August). 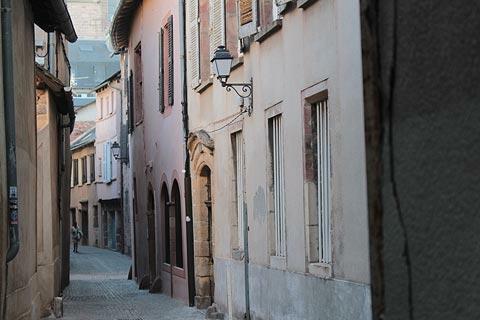 Villages to visit in the region include Entraygues (follow the signs for the campervan parking for a nice picnic spot), Espalion and Belcastel - and many others you will come across as you travel around. 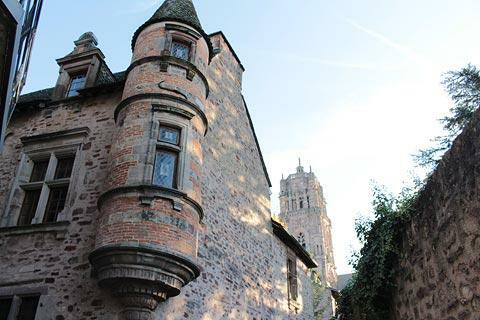 As you heard north from Rodez you will see signs for the 'Trou de Bozouls'. A curious village well worth the detour for a quick look, Bozouls is set on either side of a rocky canyon, with the houses built along the edges. Hard to imagine who thought it was a good idea to build a village where the two parts are separated by a large precipice but impressive all the same. 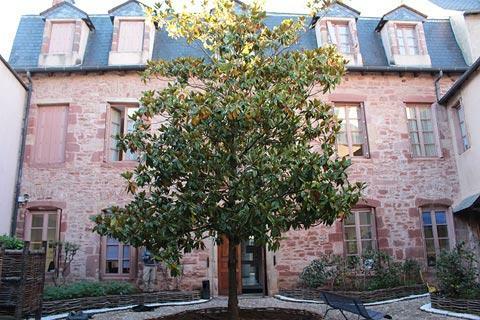 Apart from the many beautiful villages, it is the countryside of the region around Rodez that is the big attraction. 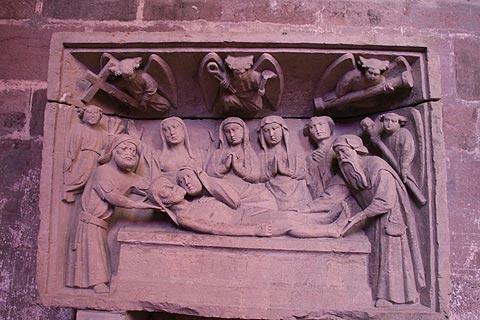 If you follow the Lot Valley from Grand-Vabre (just north of Conques) towards Entraygues it is very attractive, and the last few kilometres especially so. Likewise if you head west from Grand Vabre. The valley of the Viaur River to the south of Sauveterre-de-Rouergue is also very attractive. Wherever you go you won't find it hard to find beautiful scenery in the region. 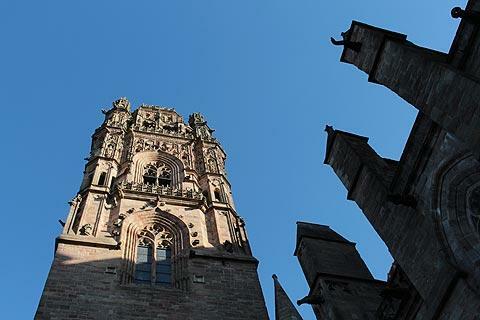 While you are driving around Rodez area you will come across Peyrusse le Roc to the west of the region. The 'modern' Peyrusse-le-Roc is a normal small village, but below the village and set into the cliffs is another, much older, village. Since its 'discovery' in the 1970's volunteers have enthusiastically cleared paths and removed debris to the abandoned village, and you can now descend by path passed various rediscovered buildings - including a synagogue and a belfry. Very interesting.